Off-season and in-season training are both key to a hockey player’s success, although, they’re both entirely different beings. At different ages a growing hockey player will reciprocate to different forms of work. For example, a junior level player will benefit most from focusing on strength and hypertrophy aspects, while a pee wee should be most concerned with strength endurance and speed work. In-season training is so key because this is the training that will allow you to keep your off-season work at maintenance. If you’re a junior level player and you make strength gains in the off-season, but lose them all by the end of the season–this is a sign of strength loss, which usually relates to size loss. The same scenario is true with younger players, if a pee wee major was able to do 14 pull-ups in the off-season, but can barely do 5 in-season, he’s lost muscle endurance which will correlate to strength. The key point is that in-season training is what keeps your off-season gains present and ready to increase in the next off-season. You can leave a season and hit the ground running because you know your past advancements are still present and primed. 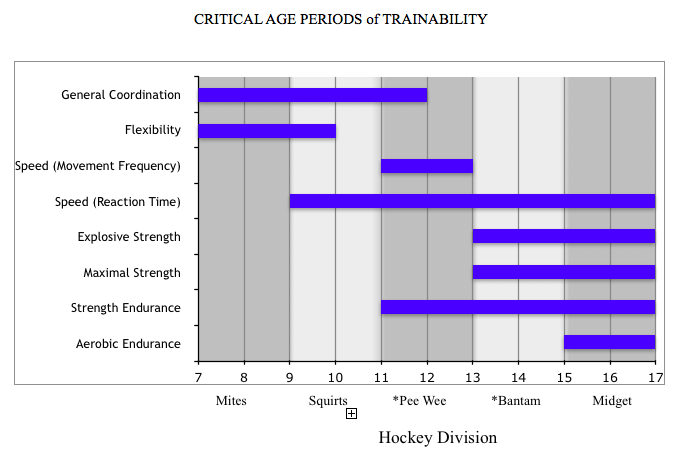 Every hockey age group has specific training aspects that will benefit them most. At this level the focus is to have no drop off in size and strength gains, an older player’s success is often dictated by how strong he is on the ice. Workouts that surround strength (lower volume) and hypertrophy (higher volume) are king and queen when keeping strength and size. Below are a few points that every junior/midget level player should follow in the off-season. •Intensity of workouts should be dictated by the volume–this is key to avoid killing the nervous system. Since you’re in season, there has to be some concern on the work:rest ratio. If you’re going super heavy with lifts at a high volume multiple times a week you’re setting your body up for failure. •Frequency (recommended 2x a week)–2x a week is the perfect balance to have a strength workout one day and hypertrophy the next. Also, it is better to couple practices and workouts on same days, this allows full days of rest which the body needs in-season. •Volume kept lower than off-season–along with frequency and intensity, volume should be kept lower in workouts for the off-season. This level has more focus on strength endurance, as opposed to max strength levels in the midget level. It is key to learn the fundamental lifting principals now, the body and muscles are growing rapidly. Learning fundamental movements will be a key to success when strength and size become the main focus. •Workouts should focus on strength endurance–the ability to do more reps of a fundamental movement will benefit for the priming of training in the future. Its beneficial to build this foundational ground, the body can then begin to grow and adapt into the stress being presented on the joints and muscles. •Various speed-work–while lifting fundamentals are heavily stressed at this level, agility and speed are also very important. With the fast development of the body, this age is primed for faster adaptation to become faster and more agile. Last but not least–the little guys. The unsung heroes in the gym who are training not only for the present, but their future selves (usually without knowing it). Gym time at this age is so key, not only for priming the body for lifting weights and training, but teaching basics such as: coordination, locomotive skills and manipulation skills. A lot of youth are missing opportunities to learn the basics by not having the education on how to train, or even the proper coaching. While you can teach and improve coordination as you get older, building a solid base at a young age sets you up for success, especially while in-season. •Locomotive skills–these are your fundamental human movements: crawling, running, jumping, skipping, etc. As the body gets older it’s increasingly more hard to pick up simple movements such as a jump to a crawl, it feels awkward and unnatural. Locomotive skills teach young ones how to move their bodies in odd situations, how to position themselves when the optimal position isn’t had. •Balance skills–balance is something that can be heavily influenced at this stage in life, through constant exposure and training balance will increase. It not only requires fundamental movements (locomotion), it requires coordination too, both of which can only be trained to a certain point. •Manipulation skills–this is your stick handling, skating with the puck, any time you’re using your balance and coordination involving something else. These aspects are key for every position in hockey and early adaptation is an easy to step for success. Every age group has aspects of training that should be emphasized and focused on to maximize potential. In-season and off-season training go hand in hand, there is a proper way to do both to increase training gains throughout the whole year.